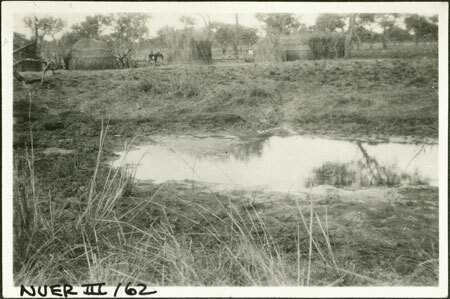 In the foreground is a pool set in a depression in a sparsely wooded area, and in the background the huts and windbreaks of an early dry season cattle camp. As the water in the pool became dry as the season progressed, the camp may move to more permanent sources such as the Sobat River, where the rest of the community would join them. Note on print reverse ms pencil - "32/7 35" & print front border ms ink - "NUER III/62"
Morton, Chris. "Nuer dry season camp at pool" Southern Sudan Project (in development). 03 Jan. 2006. Pitt Rivers Museum. <http://southernsudan.prm.ox.ac.uk/details/1998.355.130.2/>.